Welcome to Day 1 of Migraine & Headache Awareness, folks! This is one of my favorite months of the year and what better way to kick off a month than to begin a Migraine & Headache Awareness Blogging Challenge? 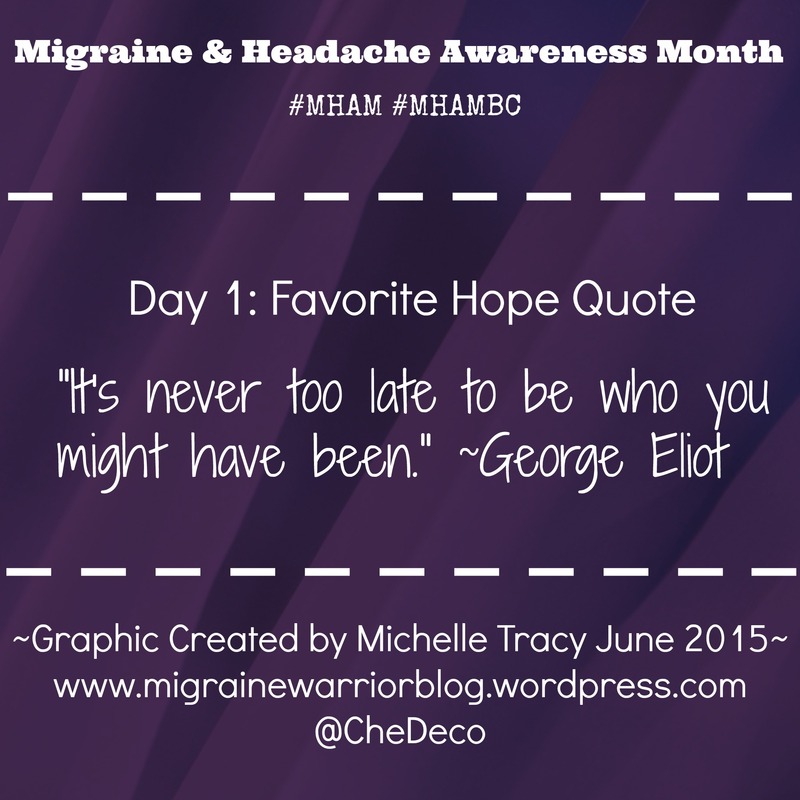 For Day 1, we have been asked “What’s your favorite quote about hope, and how does it apply to your Headaches or Migraines?” As a person who is both a migraineur and a quotations aficionado, I was thrilled to sink my teeth into this prompt! My favorite hope quote is from George Eliot, a female author who wrote under a male pen name to ensure that he works would be taken seriously. She wrote that “It is never too late to be who you might have been.” I’m going to let that sink in for a minute because it is such a powerful and hopeful sentiment and it always stops me dead in my tracks, no matter how many times I’ve heard it. Having battled chronic migraines for almost 12 years now, my capacity for hope has ebbed and flowed. I have had endured migraines for over a third of my life and I sometimes feel as though I lost the entire decade of my 20’s to this beast. I struggled to finish college (which I finally did), I struggled to keep my teaching jobs (which I ultimately was unable to do), I struggled to maintain and reignite friendships (some of which were strengthened and some of which were extinguished as quickly as a candle in a downpour.) Living this life has been a challenge. Sometimes, the only thing I can manage is to get out of bed. Other days are better and I’m able to go outside or write in my blog or even substitute teach. And then there are the days when I am confined to my migraine cave, a cold, dark, silent room where I lie in bed alone as my tears dampen the pillowcase under my head. I think about all that I have lost. I feel ancient, despite the theoretically short 30 years of life I have under my belt. It is at this time that George Eliot’s words ring in my ears, a quiet but powerful whisper of hope. She always sounds calm and confident and completely sure that I was meant for greater things. Just because life hasn’t followed the timeline that I created for myself does not mean that I cannot still accomplish all of the things I’ve ever dreamed of. It is NOT too late to be what I might have been. I am many things and I shall be many more. Dear Michelle, You have the ability to turn a truism into the truth and, simply and powerfully, to show us why. I love everything you write. Enjoy the blogging challenge. That’s my baby! She has always been the best.